A day out watching the hockey at the Olympics proved to be exciting. I know nothing of the rules in hockey – or how many players make a team, how long a match is etc etc. When players fouled an opposing player the song ‘Trouble’ by Pink was instantly blasted out – this made me enjoy the games immensely. I loved the whole buzz of the games by Strafford Station and have consequently been shamelessly bitten by the ‘Olympic Bug’. Here is a picture of the Australians and South Africans preparing for the match – watching this match was incredibly easy on the eyes, as you can imagine…. 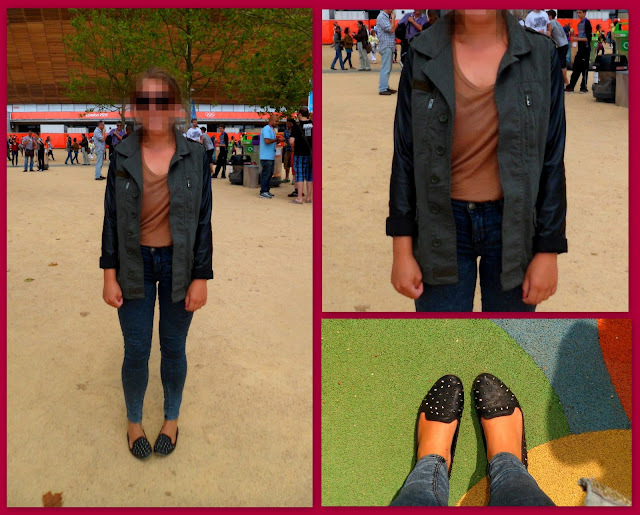 I was unaware until posting this picture that my entire outfit is from Topshop, how very imaginative of me…! The other night in London (after a few glasses of wine) I discovered that Topshop (on Oxford Street) was open until 10pm. This was an incredible fact. I really love this jacket. I feel as though it is the perfect combination of the military ‘trend’ and the leather look. My (slightly drunken) reasoning for purchasing this jacket was that the sooner I bought it, the more I could wear it. Once the alcohol had left my bloodstream I decided that my intoxciated logic for purchasing the jacket was completely justified. So I kept it. I dress from head to toe in the same 'shop' all of the time without realising it! Oh well! It's a great outfit! Aha thanks – It's the best shop so I think that makes it okay 🙂 Thanks again!